Travis CI is a cloud-based continuous integration service that supports many different programming languages and environments. If you have projects at GitHub, Travis CI might be interesting for you. I currently use it for a few of my open source projects at GitHub. Setup is quite easy, you can log in with your GitHub credentials and then you get a lit of all repos you have administration rights. Then you can configure, when Travis should run a build, e.g. on every push or pull request. The only thing you have to do is to provide a .travis.yml file at the root of your GitHub project that contains configuration info. Then a nice icon is displayed in your project description. I had some trouble running tests on Travis CI that involve SWT, that’s why I skip the tests. I am a big fan of Travis CI and recommend to give it a try! I started the year with re-designing my web site, the goal was to focus on things that I like: Software, Music, Videos and more. I also wanted to have a responsive design, that could be viewed an mobile devices and tablets, as well as on desktop computers. Yesterday we had the Eclipse Demo Camp Munich 2013 at the Siemens campus. Around 150 attendees showed up, and from the feedback I got do far, the event was a great success. All speakers: Ralph Müller, Tom Schindl, Gerrit Grunwald, Eike Stepper, Marcel Bruch, Jonas Helming, Eugen Nefeld, Matthias Zimmerman, Jérémie Bresson, and Matthias Sohn! Interested in Eclipse 4 Application Platform trainings? 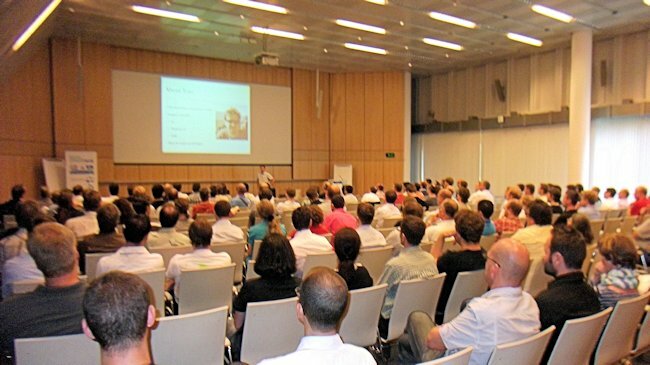 You can register and take a look at the agenda at http://democampmunich2013.eventbrite.com. After the sessions we will have great networking opportunities, a warm buffet and drinks. I am happy to announce the Kepler Eclipse Demo Camp 2013 @ Siemens in Munich, Germany. 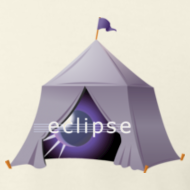 Again, excellent speakers with interesting demos/talks will make this demo camp an Eclipse fest! In the last years we had between 150 and 175 attendees, this is the mark to top this year. The latest event details and agenda you always find at the Wiki page and the registration page. At democampmunich2013.eventbrite.com you find the current list of attendees and you can register. Registration is free: beer, soft drinks and (warm) buffet is sponsored by Siemens AG, EclipseSource, Eclipse Magazin (S&S Media GmbH) and EclipseScout (BSI Business Systems Integration AG). Let’s make this demo camp great! Currently I am trying to get the JavaFX clipping working in a canvas, don’t know yet why it is not working out of the box… For me it would be great to see graphical editors in e4 and JavaFX based apps in the future. In the next weeks I will polish my implementation and contribute it to GEF4, if there is any interest. I used to write games in assembler for the Sinclairs. One game for the ZX Spectrum still runs as a Java Applet on my web site (http://www.toedter.com/en/delon/mazeofdelon.html). I always have nostalgic feelings when I remember all the fun a had with the above old computers. Which old computers did you own? What do you think about TypeScript? You find all the projects at https://github.com/toedter/e4-tutorial. Good Tycho introductions can be found at http://www.vogella.com/articles/EclipseTycho/article.html and http://www.slideshare.net/jsievers/building-eclipse-plugins-and-rcp-applications-with-tycho-ece-2012. In the project org.eclipse.e4.tutorial.contacts.model.application you find a small extension to the Eclipse 4 application model, a custom PartStack named TutorialPartStack. This extension is used in the Application.e4xmi file of project org.eclipse.e4.tutorial.contacts. To open the Application.e4xmi in your running Eclipse IDE (in model editors), you have to export the project org.eclipse.e4.tutorial.contacts.model.application into your running IDE. If you don’t want to install the model extension into your running Eclipse SDK, you could just start a new Eclipse SDK instance and make sure that the project org.eclipse.e4.tutorial.contacts.model.application is checked in the Run-Configuration. Any feedback on the tutorial projects would be highly appreciated. 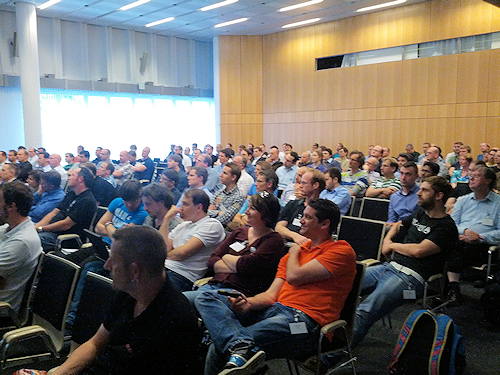 Yesterday we had the Eclipse Democamp at the Siemens campus in Munich. Since the weather was just too great and there was a European Football Championship quarter-final, “only” 131 of the 200 registered attendees showed up. Regarding the feedback I got so far, they enjoyed the event very much (Anonymous quote “Best Eclipse Demo Camp EVER!” :)). I would like to thank all attendees for coming and of course, all the speakers for their great sessions (list is ordered by speaking time slot): Ralph Müller, Tom Schindl, Sebastian Zarnekow, Frank Gerhardt, Benjamin Muskalla, Maximilian Kögel, Jonas Helming, Markus Tiede, Ralf Sternberg, and Tobias Röhm. Organizing the event was so much fun that I plan to have another one next year. CU tonight at the Democamp in Zurich, Switzerland!